Background : Dental amalgam is the primary direct posterior restorative material used worldwide, but it have certain shortcomings due to the lack of adhesiveness to the cavity. The introduction of the concept of "bonded amalgam" helped improve the use of amalgam as a restorative material. Aim : Evaluation of the comparative push-out shear bond strength of four types of conventional glass ionomers used to bond amalgam to tooth in simulated class I situations. Materials and Methods : Four chemical cure glass ionomers are used: GC Fuji I, GC Fuji II, GC Fuji III and GC Fuji VII, and are compared with unbonded amalgam. The push-out bond strength was tested using the Instron Universal Testing Machine at a crosshead speed of 0.5 mm/min. Statistical Analysis : One-way ANOVA and post hoc Bonferroni tests were used to analyze the data. Results : The results showed that the use of glass ionomer to bond amalgam resulted in an increase in the bond strength of amalgam. The Type VII glass ionomer showed the highest bond strength in comparison with the other glass ionomers. Conclusions : Conventional glass ionomer bonds to amalgam and shows a beneficial increase in the bond strength of the restoration in comparison with unbonded amalgam. Glass ionomer has been widely advocated as a protective lining under permanent restorative materials. However, few studies have been performed on the use of glass ionomer to bond amalgam. Primarily, resins have been used for bonding amalgam. Chen et al. compared restorative glass ionomer and resin to bond amalgam, and stated both to be equally effective in bonding amalgam. The use of glass ionomers can provide advantages like decreased microleakage and postoperative sensitivity while increasing resistance to fracture of both tooth and amalgam as compared with unbonded amalgam restorations. Several different glass ionomers are presently used in restorative dentistry. They vary in their mechanical properties and clinical applications. Assessment of how they interact with amalgam when used as adhesive liner is very important in anticipating the efficacy of clinical use. In this study, the push-out shear bond strength of amalgam condensed with four different unset glass ionomers is compared. Fifty extracted caries-free lower human molars were collected, cleaned and disinfected prior to use for the study. Discs of thickness 3 mm were prepared by grinding the decoronated teeth from the cuspal side and pulpal side. The discs were then polished with a 320-grit silicon carbide paper and the thickness was checked with a digital vernier calipers. The sample was stabilized on a metal jig and a central cylindrical cavity of diameter 3 mm was prepared using a template and a straight fissure bur (SF21) held perpendicular to the sample surface to ensure parallelism. All the dimensions of the tooth sample and the cylindrical cavity were checked with a digital vernier calipers. They were then divided randomly into five groups each having 10 specimens each. Groups one to four served as the test groups and group five served as the negative control group [Table 1]. Preproportioned amalgam capsules were used to standardize the amalgam and they were triturated in an amalgamator. In all the samples, the amalgam was condensed by a serrated round condenser with a diameter of 1 mm by a single operator to standardize the condensation pressure. The discs were kept on an oil-resistant paper pad during condensation to act as the matrix at the bottom of the cylinder while being nonadhesive to either the glass ionomer or the amalgam. The surface of the cavity in the test groups was conditioned by applying 10% polyacrylic acid for 20 s with a disposable applicator as per the manufacturers recommendation. In the test groups, the glass ionomer cements were manipulated according to the manufacturer's recommendation and a thin uniform layer was applied on the inner walls of the cavity with an applicator. After the glass ionomer was applied, the triturated amalgam was condensed in the cavity prior to setting of the glass ionomer. In the control group, no adhesive cement was used to coat the cavity walls. The amalgam was triturated and condensed in the cavity. Excess amalgam was removed from all cavities with a Hollenbeck carver. All samples were then kept as such for 24 h to allow proper setting of the amalgam. Metal discs were custom-made with holes of diameter 3.5 mm to mount the specimens and a 2.5-mm diameter custom-made cylindrical stainless steel punch was used for testing. All three (metal punch, specimen and metal disc) were place in alignment [Figure 1]. Push-out test was performed at a crosshead speed of 0.5 mm/min using the Instron Universal Testing Machine (Norwood, MA, USA). The debonded specimens were viewed under a stereomicroscope at 10X magnification to check the mode of failure. 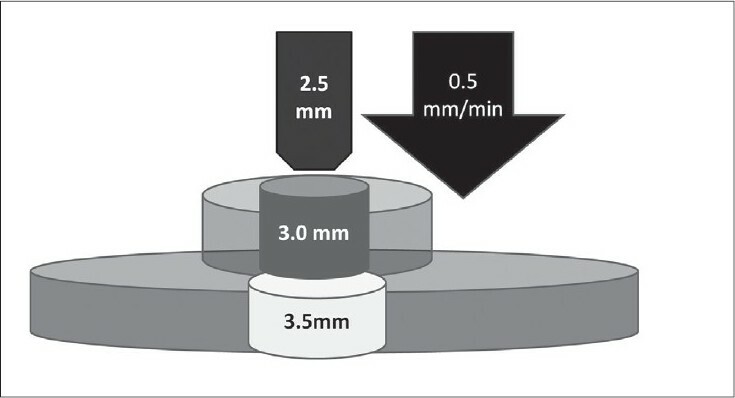 The maximum load at the point of fracture was measured and the push-out shear bond strength was calculated for the 3 mm X 3 mm cylinder of amalgam. The values were then statistically evaluated with one-way ANOVA and the intergroup comparison was performed with the post hoc Bonferroni test [Table 2]. The mean bond strengths of the test groups show a statistically significant increase in the bond strength of the amalgam bonded to the tooth with glass ionomer being used as the adhesive. The statistical analysis using one-way ANOVA revealed overall statistically significant difference between all the groups at P <0.001 [Table 3]. Intergroup comparison with post hoc Bonferroni test shows that there is no statistically significant difference between group two and four (P = 0.07). All other groups show a statistically significant difference (P < 0.05). The failure mode assessed in the study was performed under a stereomicroscope at 10X magnification and a mixed, adhesive/cohesive failure of amalgam and glass ionomer interface was observed. Amalgam, from the time of its introduction, has proved to be a permanent restorative material with good longevity. However, the lack of adhesiveness of amalgam necessities a cavity design that provides retention for the restoration. , The conventional cavity design for amalgam restorations results in a reduction of the original strength of the tooth by half to three-fourths. Glass ionomer formulations have been evaluated as an adhesive with amalgam for the restoration of prepared teeth. ,, Certain glass ionomer formulations have demonstrated increased shear bond strength measurements of amalgam to dental hard tissue comparable to that achieved with resin systems. ,, The fracture resistance of teeth restored with the bonded amalgam technique using restorative glass ionomer as an adhesive has been shown to be greater than that of prepared teeth alone and teeth restored with amalgam using a copalite liner. ,, However, bonding still remains as an adjuvant to increased retention of amalgam. Glass ionomer formulations used in the study vary in their particle size and powder liquid ratio, but they are all conventional glass ionomers with the same acid-base setting reaction. This would suggest the same affinity to react with the metal ions in amalgam. It ensures good marginal sealing and decreased marginal microleakage postoperatively. The bond strengths of amalgam with glass ionomer show statistically significant differences. This is due to variations in the mechanical properties exhibited by the glass ionomers. The powder liquid ratio has a definite effect on the mechanical properties of glass ionomers. The glass ionomer groups with lower powder content like groups one (luting) and three (pit and fissure sealant) show lower bond strength to amalgam. However, they still show a better bond strength when compared with the control group, proving that the use of glass ionomers will increase the bond of amalgam to tooth. There is no statistical difference between groups two (restorative) and four (caries stabilization and prevention) glass ionomers. The more recent glass ionomer Type VII has been developed for multiple uses, which include as a restorative and sealant. The powder particles undergo a fritting process that makes them more reactive and help early development of the mechanical properties. This may also allow the cement to develop higher bond strength with amalgam, as demonstrated in the study. The restorative glass ionomer (group II) with the higher powder content attains a good bond to amalgam, and is comparable to the bond strength attained by commonly used resin bonding agents as shown by Chen et al. The debonded specimens were viewed under a stereomicroscope at Χ10 magnification to assess the mode of failure and make sure that none of the specimens showed failure due to fracture of the tooth specimen. All specimens showed intact sample margins and the bonded area showed a mixed pattern of failure. Areas of both adhesive and cohesive failure of amalgam and glass ionomer were seen in the inner surface of the sample. The nominal surface area was not measured as the study aimed to assess the bond strength of amalgam to tooth with glass ionomer as bonding agent in a simulated class I cavity situation, not the individual interfaces. Similar findings of failure of the amalgam bond to tooth being a combined adhesive/cohesive failure at the resin or glass ionomer amalgam interface is seen in several studies. ,,,, The bond of the cement to the tooth and amalgam is higher than the inherent strength of the cement; therefore, when failure of the bond occurs, it is mostly cohesive in the cement. The bond interface is dependent more on the amalgam glass ionomer interaction. The ionomer bond to tooth is more uniform and strong as the preactivation of the tooth by precondition ensures a good bond. The condensation of amalgam prior to setting of ionomer causes the intermingling of the two materials. The chemical affinity of ionomer to silver and tin also helps in adhesion. , Thus, the use of glass ionomers with better mechanical properties that help resist a cohesive or adhesive failure is preferred to bond amalgam. An increase in fracture resistance of teeth restored with the bonded amalgam technique using both resin and glass ionomer luting cements is evident. ,,,,, This, along with the decreased microleakage ,,,,,, and the resistance to development of caries at the margin due to the fluoride release from glass ionomer, suggest a definite advantage to the concept of bonding amalgam restorations with glass ionomer as the adhesive liner. The use of glass ionomers to bond amalgam results in an increase in the bond strength of amalgam to the tooth. The mechanochemical bonding and the sustained fluoride release due to glass ionomer will increase retention of amalgam restorations, and is expected to be beneficial to increase the longevity by decreasing marginal leakage, fracture of the tooth, postoperative sensitivity and incidence of recurrent caries. 1. Mahler DB, Nelson LW. Sensitivity answers sought in amalgam alloy microleakage study. J Am Dent Assoc 1994;125:282-8. 2. Gwinnett AJ, Baratieri LN, Monteiro S Jr, Ritte AV. Adhesive restorations with amalgam: Guidelines for the clinician. Quintessence Int 1994;25:687-95. 3. Varga J, Matsumura H, Masuhara E. Bonding of amalgam filling to tooth cavity with adhesive resin. Dent Mater J 1986;5:158-64. 4. Curtis RV, Brown D. The use of dental amalgam an art or a science. Dent Update 1992;19:239-42, 244-5. 5. Wilson AD, Kent BE. A new translucent cement for dentistry. The glass ionomers cement. Br Dent J 1972;132:133-5. 6. Hotz P, McLean JW, Sced I, Wilson AD. The bonding of glass ionomer cements to metal and tooth substrates. Br Dent J 1977;142:41-7. 7. Chen RS, Liu CC, Cheng MR, Lin CP. Bonded amalgam restorations: Using a Glass Ionomer as an adhesive liner. Oper Dent 2000;25:411-7. 8. Setcos JC, Staninec M, Wilson NH. Bonding of amalgam restorations: Existing knowledge and future prospects. Oper Dent 2000;25:121-9. 9. Boyer DB, Roth L. Fracture resistance of teeth with bonded amalgams. Am J Dent 1994;7:91-4. 10. Jagadish S, Yogesh BG. Fracture resistance of teeth with class 2 silver amalgam, posterior composite and glass cermet restorations. Oper Dent 1990;15:42-7. 11. Marchan S, Rafeek R, Coldero L, Smith W, Ramcharan K. An in vitro evaluation of the shear bond strengths of glass Ionomer/Amalgam combinations. CPD Dentistry 2004;5:90-4. 12. Neme AL, Evans DB, Maxon BB. Evaluation of dental adhesive systems with amalgam and resin composite restorations: Comparison of microleakage and bond strength Results. Oper Dent 2000;25:512-9. 13. Mount GJ. Longevity of glass ionomer cements. J Prosthet Dent 1986;55:682-5. 14. Hoshi AT, Sliva SM, Pavarini A. In vitro evaluation of the marginal microleakage of amalgam restorations associated with dentin adhesive, glass ionomer cement and cavity varnish by means of different evaluation methods. J Appl Oral Sci 2005;13:10-4. 15. Fronseca RB, Branco CA, Quagilitto PS, Goncalves Lde S, Soares CJ, Carlo HL, et al. Influence of powder/liquid ratio on the radio density and diameteral tensile strength of glass ionomer cements. J Appl Oral Sci 2010;18:577-84. 16. Ng BP, Purton DG, Hood JA. Effect of lining materials on the shear bond strength of amalgam and gallium alloy restorations. Oper Dent 1998;23:113-20. 17. Rasheed AA. Effect of bonding amalgam on the reinforcement of teeth. J Prosthet Dent 2005;93:51-5. 18. Mathew BP, Hegde MN, Hegde P. Fracture resistance of molars with bonded class II Amalgam restorations -an in- vitro study. J Conserv Dent 2006;9:43. 19. Akle WS, Staninec M, Lacy AM. Effect of bonded amalgam on the fracture resistance of teeth. J Prosthet Dent 1992;68:257-60.